The boardgaming world is a lot like Hollywood, sometimes: months can go by with nothing in the theaters but subtitled snorefests or the latest McConaughey/Hudson romantic comedy, and then, suddenly, we get The Avengers vs. JLA, Son of Jaws, and Massive End of the World Movie, Part 3 all in the same weekend. Autumn has been a bit like that for boardgames, with ships heading into port loaded with cardboard goodies on what has seemed like a daily basis. Monkey238 and I have been playing as much and as quickly as possible, but in times like these it’s great to break out this handy standard feature with brief impressions on a notable few, many of which will be getting the full Dice Hate Me treatment in the weeks ahead. Deck-builder. 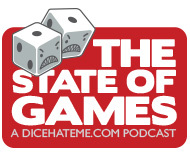 For many gamers, that particular nomenclature conjures up waves of joy and delight; at Dice Hate Me HQ, however, it’s almost akin to a four-letter word. Yes, Monkey238 and I have become a bit infamous for our distaste of the latest multiplayer-solitaire du jour, but we endeavor to always keep an open mind. And, so, it was with honest and mounting curiosity that made us look forward to the arrival of Eminent Domain – the only nervous question after opening the box was whether this touted title would help redeem the genre for us. To make a short review even shorter: Yes. Within ten minutes of carefully working our way through the first few turns of EmDo, we looked up at each other and instantly agreed that this was no Dominion, and that’s a very good thing. If anything, the role selection and empire-building aspects of the game reminded us of the much-beloved San Juan. With varied tactical decisions to make each game and a seemingly-endless supply of strategic start-game paths to choose from (not to mention a healthy technology tree! 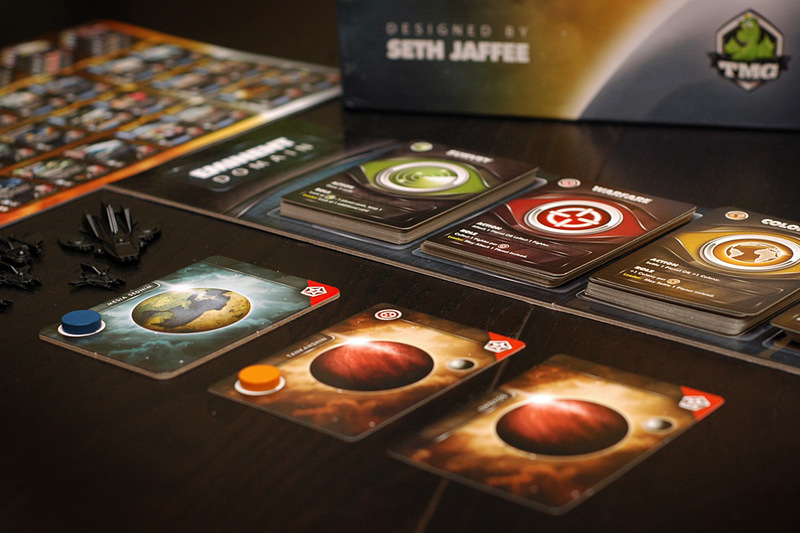 ), Eminent Domain not only redeems the deck-builder – for us, it serves to redefine it. As it’s been stated before, space is an awfully big place; thankfully, we have a large gaming table to accommodate it. Ascending Empires packs a lot of gaming goodness into one medium-sized box, but it definitely demands some breathing room. That’s mostly because Ascending Empires employs one of my favorite, newly-discovered gaming mechanics: dexterity. For those not in the know, Ascending Empires is a lot like taking Twilight Imperium, trimming about 80% of the fat, and then tossing PitchCar into the box. For those dear readers just joining the blog, Monkey238 and I have long lauded the virtues of a good night of murder – most notably when ol’ Jack the Ripper heads out for a night on the town in Mr. Jack. 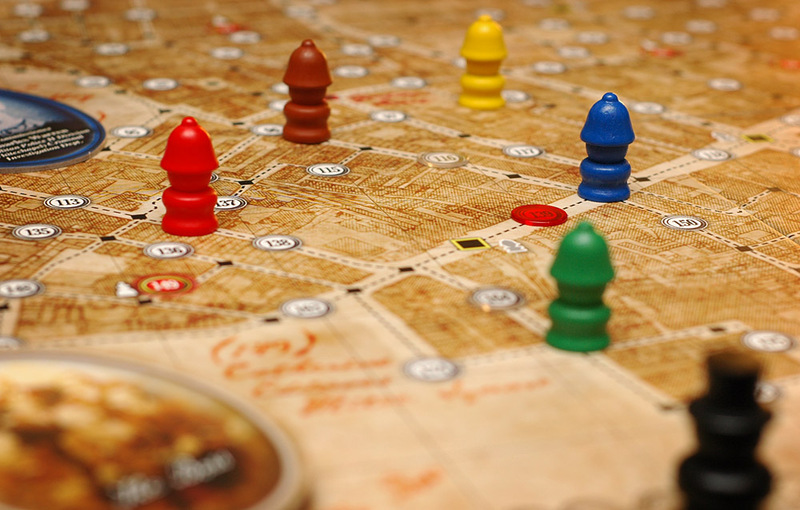 Being a huge fan of deduction games such as old classics like Scotland Yard and the new classic Mystery Express, Letters from Whitechapel seemed like a no-brainer to add to our collection – especially since Chris Norwood hasn’t shut up about it for two months straight. So why did we wait so long to play? It’s a mystery. What isn’t a mystery is how good the game really can be – provided you have more than two players. Yes, chasing down Jack the Ripper through the dark, foggy streets of Whitechapel sounds like a great setting for a classic game of cat and mouse, but when it’s only one-on-one (something in which Mr. Jack excels), Letters falters. What intrigues us about the game is the benefit of group-think that goes on with two or more investigators on the hunt; some will go against another investigator’s gut and pick up an unexpected clue, and some investigators seem to be just plain lucky. 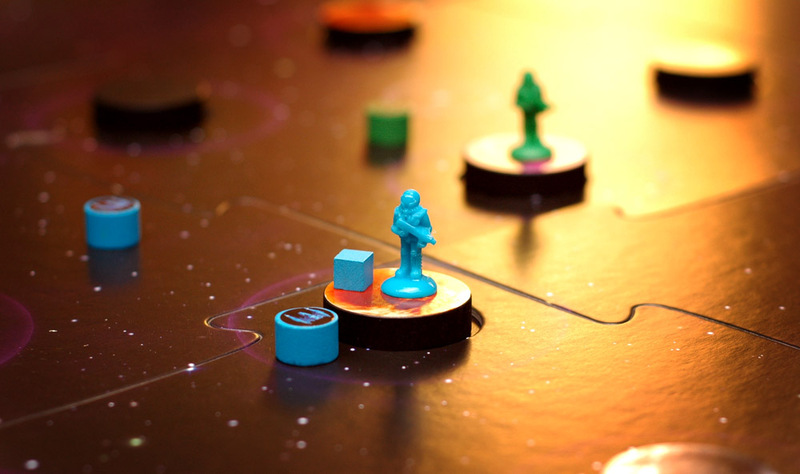 Yes, I’m proposing that the game is a prime example of social deduction – and that places it square in our wheelhouse. That said, however, the intrigue deepens. The first three games of Letters were magical – the last two were not. Honestly, we’re puzzled. Monkey and I look forward to furthering our investigation into the phenomenon, so look for a more detailed report in Dice Hate Me very soon. Despite the grumbles and head scratches from many a gamer, I have been a total sucker for the Games Magazine 100 since I was a teen. Last year, the Game of the Year was awarded to Jump Gate from a plucky independent designer by the name of Matt Worden. The game was self-published through The Game Crafter – a reason why it raised more than a few eyebrows when it took the crown. Since I read about Jump Gate in the pages of Games, I knew I wanted to play – spaceships, warping around the galaxy, exploring planets, dodging black holes… yes, please. Luckily for me, Matt was kind enough to send one of the special editions of Jump Gate to Dice Hate Me HQ. After playing, I can definitely say that Jump Gate is pretty much everything I wanted it to be: easily-accessible, quick-playing, with multiple paths to victory, and just the right amount of tension from tough micro-decisions. Also, there’s the little x-factor thrown in that I like to call fun. So far, Jump Gate has been worth the wait and the hype, and I look forward to introducing the family to it over the holidays. When this somewhat-hefty title by Stratus Games first arrived at Dice Hate Me HQ, it fell immediately into the dark depths of a very, very large shadow. You see, when it comes to games about volcanic eruptions, there is one legendary game that cannot be ignored; I’m speaking, of course, about Fireball Island. Now, a game of the epic magnitude of Fireball Island is likely to never be produced again (more’s the pity), but for a game that has no giant Tiki god, nor fiery rolling marbles, nor little plastic guys to fling joyously about the board, Eruption is actually pretty good. 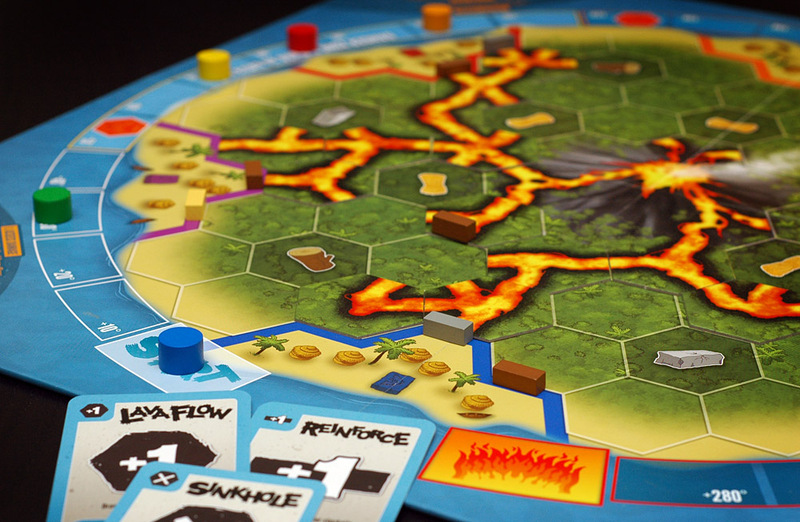 In Eruption, the volcano in the center of the island is erupting (naturally), and each player’s goal is to protect their village through the use of walls and special cards, all while directing lava toward their opponents’ villages while laughing maniacally. Ok, so the laughing is optional, but it’s definitely encouraged. 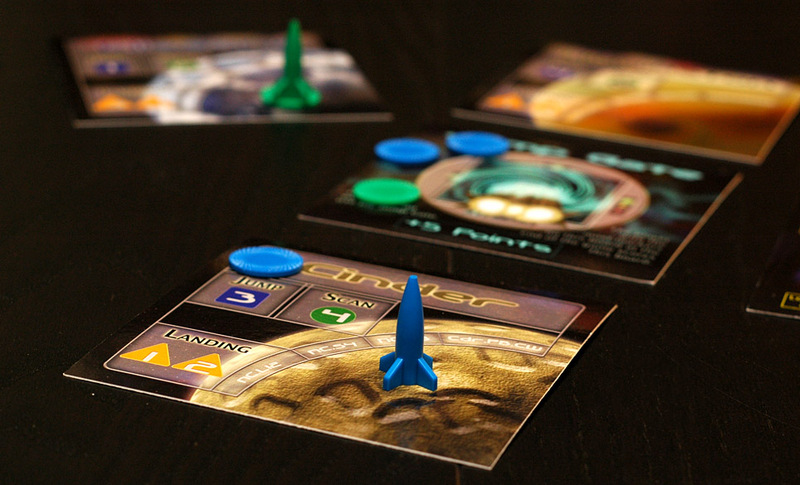 The play is quick, easy to pick up, and offers a lot of replay value across a wide variety of gamers. However, the often-cutthroat tactics and take-that gameplay could upset players with thin skin. Luckily for us, we don’t know any of those kinds of players – so let the lava flow freely! Back in the 1984, Milton Bradley introduced the Gamemaster series of board games, all of which came in gigantic boxes with awesome art, amazing promised gameplay, and lots and lots of plastic pieces. My ten-year-old head just about exploded. Luckily over the next few years, my parents bought me first Axis & Allies and then Fortress America, both of which I devoured. One title which eluded me despite the constant begging & pleading was Shogun – later to be named Samurai Swords. For most of my teen years, this game was to be my white whale. Now, 20-some years later, I finally got a chance to play the game that had eluded me for so long – only now it was called Ikusa. 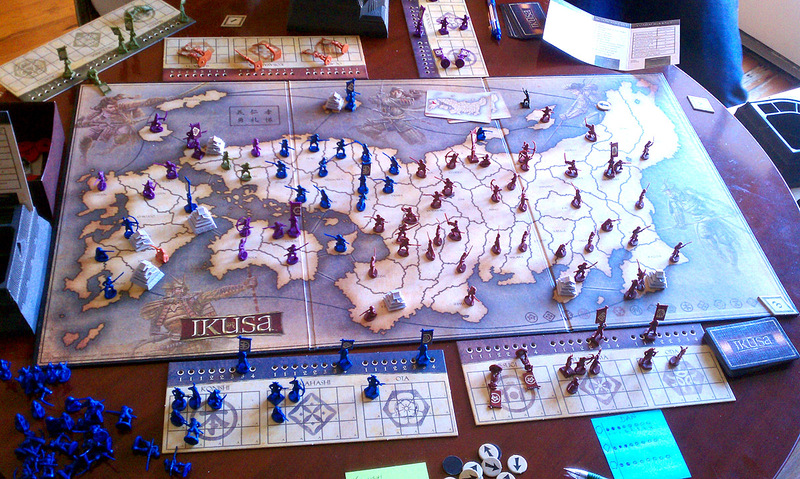 I am now thankful for the wait – Ikusa is, in a word, brutal. I have played many, many games that involve marching across landmasses, laying waste to opponents, but none seem to match the wanton brutality that is at the heart of Ikusa. In games like Axis & Allies, and even the modern Shogun by Queen Games, you have to balance military strength with looking after the homeland, trying to eke out the best IPCs or feed your people with rice. Not so in Ikusa; in this land of Japan, it’s kill or be killed. Diplomacy can keep someone at bay for awhile, but sooner or later, they will come for you – in your sleep. Paranoia sets in. Hungry eyes skirt the table, sizing up opponents. It’s ugly. And, yet – so beautiful. For the most part, I would rather play the far more complex and balanced modern Shogun today; but for that inner ten-year-old that often yearns to be satisfied, Ikusa satiates my gaming soul – with the blood and tears of my enemies. I wouldn’t mind more articles like this. I enjoy quick snapshots so I know which games to investigate. Eruption is a very good game. I got to play this three times at BGG Con. This is one of those games that after it is taught to you you can then teach it. The rules are that easy. The game scales well, too. I played it with three then four then six. Excellent article! I’ve tried two of the games you mentioned and glad to see them getting some more geek love. I have yet to play Eminent Domain (really, really want to try this with my oldest little geek), Ascending Empires, Letters From Whitechapel, and Ikusa. Based on what I’ve read so far (having missed the opportunity to play it), I’ve been firmly on the fence about Eminent Domain. But if it reminds you more of San Juan than Dominion, then it’s going on my short list. I enjoyed your quick, concise reviews for these games. I’m also looking for your final verdict on White Chapel which is on my radar. Thanks for your great work! Kevin – Thanks for reading! Yeah, Eruption is pretty easy to get into and teach, that’s for sure. We have more about Eruption in our current State of Games podcast about playing with our families. Father Geek – Thanks much! 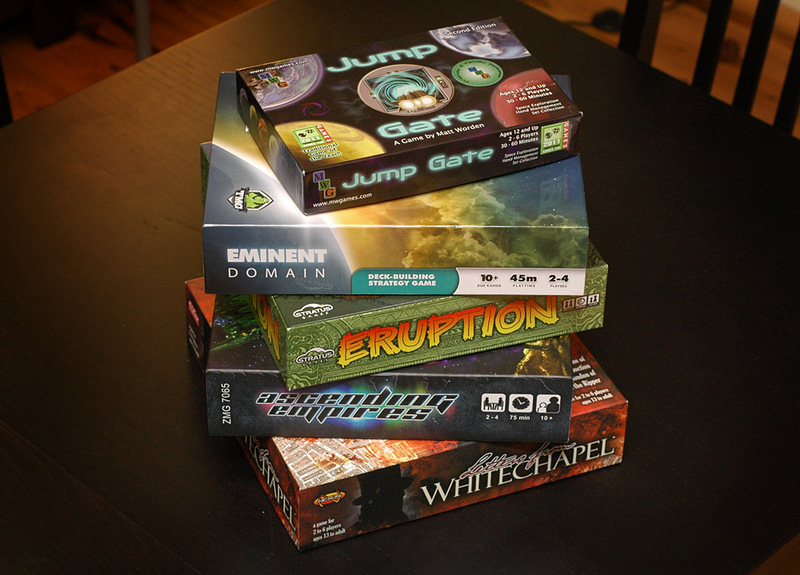 You really need to try out Eminent Domain – I think you’ll like it a lot. In fact, I think you’ll like all the games you mentioned that you haven’t played. Thanks for stopping by. Paul – If you like San Juan you need to play Eminent Domain. It’s also a good two-player game, so I know that factors into your decision. Anthony – Thanks for the kind words and for reading! We have more thoughts on Whitechapel in our current State of Games podcast – but the verdict is still out. We’ll keep playing and updating!